I can’t believe Ramadan is just around the corner! Time truly flies. Also, the questions about cheap Umrah in Ramadan have started to come up faster than I can answer. So I thought I will just create a post about the prices you can currently find for Ramadan Umrah in 2018. Please note that if you are going for Umrah for the second time in the year or you have been last year you will have to pay extra 2,000SAR per person. You can read more about this here. This year Umrah is expected to start from 15th of May to the 14th of June 2018. As we know the dates are not set and they will depend on the moon sighting. I cannot possibly provide you with all the information or routes but I try my best to provide the best options that can match as many people as possible. If the flights below don’t work for you then you can use Skyscanner to find the flights or Tripadvisor / Hotels.com to book your hotels. 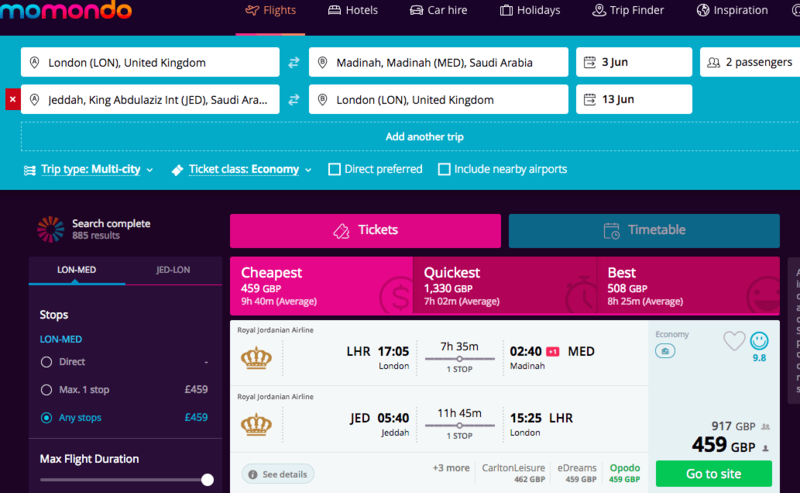 Currently, from London, you can find some great flights with Royal Air Jordanian from as little as £450 return during the mid to end of Ramadan. If you want direct flights to Jeddah with Saudi Airlines then the price is approximately £556 return during the same period. I think it is better to go London-Medina-Jeddah-London as this way you can actually skip the long queues in Jeddah airport or the fact you might arrive at the Hajj terminal. I know this doesn’t happen often when you do DIY Umrah but it is better to avoid it. Flights with Kuwait Airways is £430 which is an excellent price for this busy time. Hotels in Medina during Ramadan are cheaper than in Makkah. I personally find it also much peaceful in Medina and I know a lot of people who prefer to stay there during that time. In this example, you can spend 3 days in Medina but of course, you can adjust as well. I use Hotelscombined.com and as it is an aggregator it gives you good prices. I have had awesome savings with it and it is one of my go-to sites. The Pullman Medina is a very good hotel option and for the 3 nights from the 3rd of June to the 6th of June costs £471 but it is close to the Masjid. A much more expensive option but close to the Masjid is the Hilton Medina which comes to £1,200 for the 3 nights. Lastly, if you are a member of Marriott hotels the Marriott in Medina is approximately £300 for the three nights. Recommended hotel in Medina: Pullman Medina since it is newer and nicer property with good reviews. Price wise it is a little higher but it is all down to preference. There are so many hotels in the area. I always like to search for hotels first with Hotelscombined as it curates all the options for me and then I go to the individual site to book. This is helpful especially with Hotels.com as you can earn a free night after every 10. The nights I am looking at hotels in Makkah are 6th June to 13th of June. Of course, there are also alternatives to these and you can use the sites above to check them or click the links. Now, there are plenty of hotels in Makkah and you can have the super luxurious Conrad hotel which I review here for £4,900 or the Hilton Makkah Convention review here for £4,000 for a week in the last nights of Ramadan. Now if you are a reader you have seen my previous article on the great new cheap hotel options in Makkah. They might be a little further away but they do offer good prices and quality. Le Meridien Towers is a 10-minute bus ride but it is also part of the Starwood hotels so you can earn points against the stay. Rooms for the 7 nights cost £1,400 in total including breakfast. 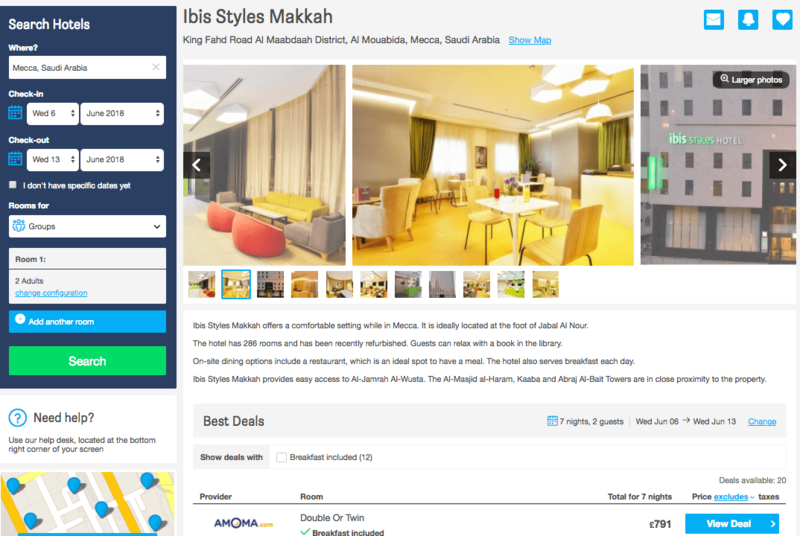 Ibis Style is a new hotel in Makkah and part of the main Ibis hotel brand. It is one of the cheapest but good options in the area with a 5 minutes bus ride to the Haram. For 7 nights with breakfast, this hotel comes to about £790 for the last 10 nights of Ramadan so it is a good value for money. M Hotels Makkah by Millennium is another new hotel which for the Ramadan nights also seems a great value considering that it is a 5-star property. Yes, it is a little further out and it is reachable by bus but the quality and money saving makes it a very good option. For 7 nights it comes to £1,050 and £1,350 with breakfast. It also comes with a free cancellation which is handy especially for Umrah. 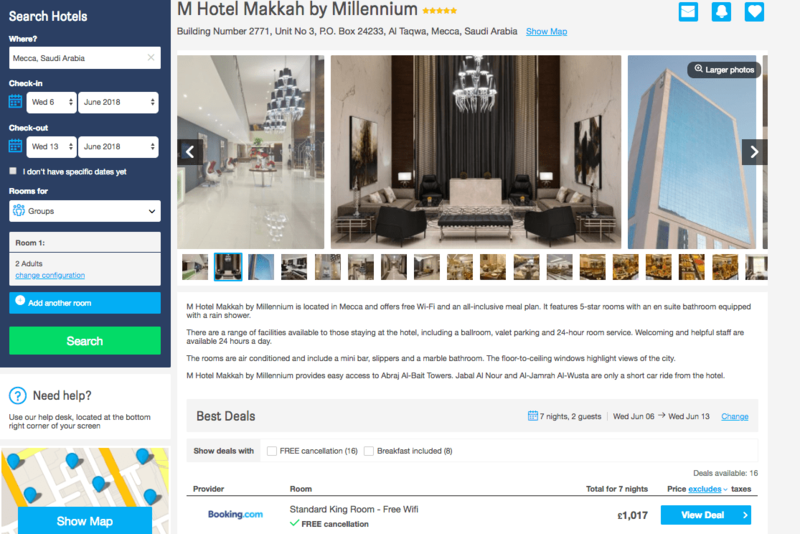 Recommended hotel in Makkah: M Hotel Makkah by Millennium, the reviews are good and the property standard also. If it was closer to the Haram it would be 10x more. Transportation is much easier than people think between Makkah and Medina. I would recommend the SAPTCO VIP bus which is a reliable, comfortable service and it costs around £30 per person. Just make sure you buy your tickets when you arrive in Medina rather than waiting until the last day since it gets busy. From Jeddah, there are plenty of taxis where you can negotiate a price with them to take you directly to the airport and it shouldn’t cost more than £60 for the car. You can read more about transportation here. The total price for a DIY Umrah in Ramadan is not as high as people believe, comparing to the standards of Umrah agencies you can have a significant saving and still a good enjoyable Umrah. Umrah packages start for 3 stars from £2500 per person in the last nights where buy DIY-ing your way in you can have a good 4 star Umrah for £1,400 per person. If you find these posts helpful I would appreciate if you use the links above to make your bookings we do earn a small commission at no extra cost to you to keep the site going. Thank you for your support to MTG! Ma Sha Allah a very useful guide some good tips which I found very useful. The only downside is we are at the mercy of agents when it comes down to visa they are charging ridiculous amounts for visa only. A visa only should cost only £80 per person if you haven’t been the previous year.